On the morning of March 2nd, I had a Non stress test scheduled for 8 since I was almost a week and a half over my due date. I started getting mild contractions around 5:30AM, but I didn't think they were anything serious, and they weren't coming frequently. On the drive down to the hospital, the contractions were getting a tiny bit stronger, but I still shrugged them off. Once I got there the nurses started getting me hooked up to the machine to check Ember's heart rate and to monitor contractions. Ember was doing fine, but the nurses noticed that I was having some contractions so they sent the OB over to check on me (figures, out of the 6 OB's at the hospital, the one I hated was the one who was there that day). She did an internal and told me that I was three centimeters dilated. Since I was scheduled to be induced the next day, and I was having contractions, she asked if I wanted her to break my water so I could have Ember that day. I agreed almost immediately! After a short wait for a room, I was allowed to call my husband and mom to tell them to get to the hospital (it also figures that the one day I go alone is the day I was going to deliver). While I waited for them to arrive, one of the nurses came in to put my IV in. After 5 (very painful) attempts by her, she finally decided that she couldn't do it and called in a specialist. I'm so glad she did, because the specialist got it in first try with no pain at all. I was very glad when my husband and mom got there because I was starting to get bored and anxious waiting in a huge room all by myself. The company really helped relieve my anxiety. All the while my contractions were starting to get stronger and closer together. Another nurse came in to check up on me, but she noticed the contractions weren't registering on the screen. I was then asked if I wanted to go home and come back tomorrow, which I replied with a "NO!" It turns out that the little pad thing that was on my belly wasn't on the right spot, so it wasn't finding anything. Once that was fixed, the machine started up and found them all. The OB came in shortly after to do another internal. After only a little over an hour, I dilated to about 5 centimeters. That is when she decided to break my water, which surprisingly didn't feel like anything. At that point I realized that there was no turning back...I was going to have a baby that day! My contractions really started to pick up, then. They got really intense and Ember dropped a lot in a short amount of time. Pretty much the only thing I could do was kneel on my knees next to the bed and do my deep breathing. After about another hour, I told the nurse that I was starting to feel the need to push. The nurse checked me out, but I was only 8 centimeters dilated so I had to wait longer. After a little while I REALLY needed to push, so the OB was called in to check me. At that point I was 9.5 centimeters, so I did a practice push. The OB wasn't able to make me dilate more so I was stuck in transition until I naturally got to 10 cms. Transition was AGONY! 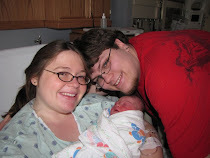 This was the one point in labor that I felt like giving up because it hurt so badly. Luckily I got through it and was finally dilated enough. At that point pushing felt like a relief! After about ten pushes, Ember Rose was born at 1:31 PM. She had her cord wrapped around her neck once, and it took a brief moment for her to start breathing, but that first cry was beautiful. The OB immediately put her on my chest and I started bawling! She was the most gorgeous baby and it was the happiest day of my life.